Over the weekend my husband and I attended a little cookout with a few friends. It was fun to be able to hangout with friends on the weekend, and not have to worry about hubby getting home at a decent hour to work the next day. It’s been awhile since we could enjoy a weekend together. So everyone that came to the cookout decided to bring some sort of dish to go with the main course the host was making. I of course made my awesome guacamole, but I also wanted to bring an appetizer too. Something for everyone to snack on while waiting for dinner. I knew that I had a few packages of cream cheese in my fridge that needed to get used up, so I decided on making 2 cheeseballs. One, more traditional in flavor, and the other with a little indian twist. 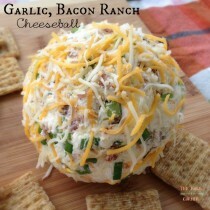 The first is a Garlic, Bacon, Ranch cheeseball. Not only does it have a lot of garlic and bacon in it, but it also uses some of the seasonings that are in those ranch dressing packets. I didn’t want to use the pre packaged stuff if I could help it. All you have to do is bring your cream cheese to room temperature. I usually let mine sit out for about 2-3 hours. 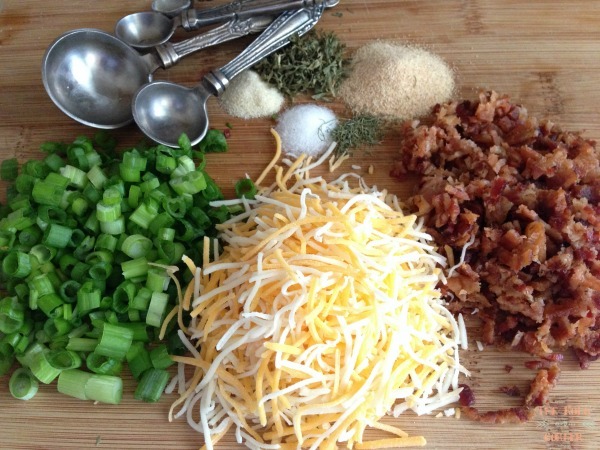 Then you chop up your cooked bacon, and green onion. 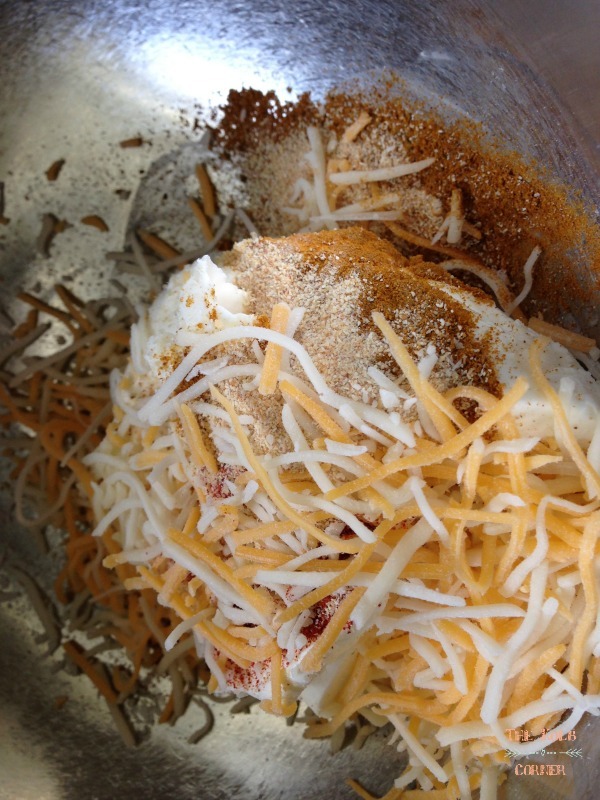 Add in your seasonings, onion, bacon and cheese to the cream cheese and mix thoroughly with your hands. 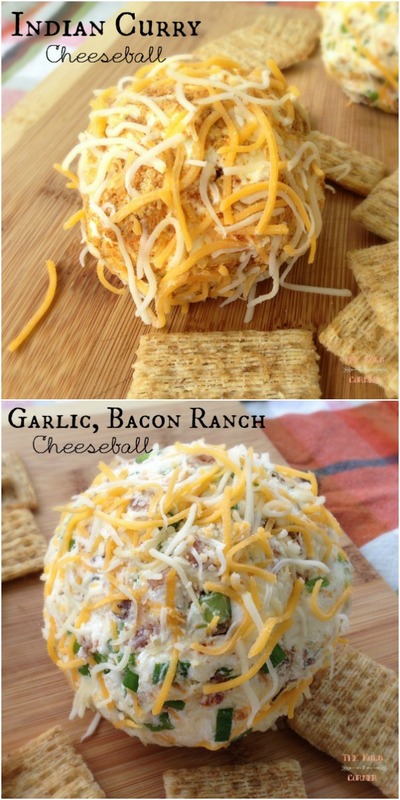 Shape it into a ball and roll it in a little more shredded cheese and there you have it! For the second one, I added shredded cheese, curry and other spices to cream cheese. I have used this mixture in the past when I’ve made cream cheese stuffed peppers<—–amazing–but I’ll have to share another time! 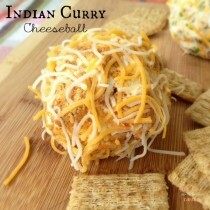 Mix everything together with your hands, shape into a ball and roll in shredded cheese! Both of these are served great with Triscuits, Wheat Thins, or any other cracker you prefer. Keep them refrigerated until you are ready to serve! In large bowl combine all ingredients minus 1/4 cup shredded cheese. Mix thoroughly with hands and shape into a ball. 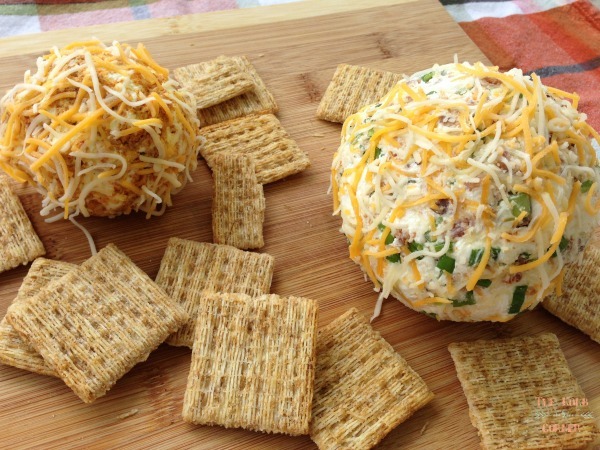 Roll ball in remaining shredded cheese. I’m sure we’d love it!! Thanks Winnie! I hope you like it! I hope you do Kristen! They are so easy. Let me know how you like them! Thanks for stopping by! I love cheese & I think I could eat this by myself. Sad, I know. Thanks for sharing! Happy Wednesday! Not sad at all! If I didn’t have to share with my husband and others, I would have eaten it all too! Thank you for stopping by! 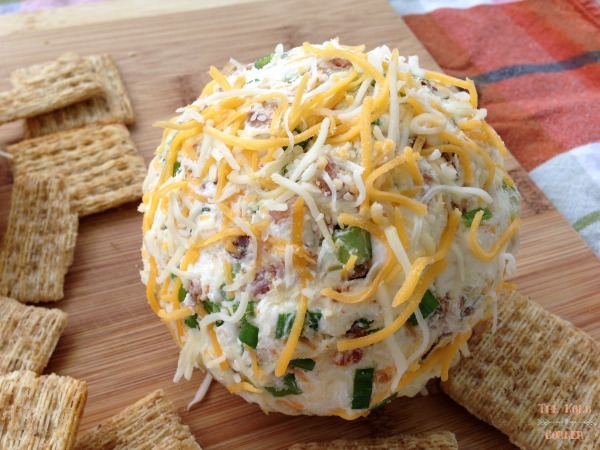 I can see my kids devouring this bacon cheeseball. Pinned and will be featuring on today’s Merry Monday.